Androgenetic Alopecia (AGA), the most common cause of hair loss in men, is a problem that effects millions of people worldwide. And while there are drugs on the market that claim to treat the condition – namely, minoxidil and finasteride – they tend to only cover up the problem as opposed to treating it at its source. There are many factors that contribute to the development of AGA, including genetics, lifestyle, hormones, and environment. One particular factor is Prostaglandin D2 (PGD2). In this article, I’ll introduce PGD2 and the role it plays in hair loss as well as the scientific studies that definitively prove this link. I’ll then discuss the process of PGD2 production and the possible treatment options available. Let’s get started! Prostaglandin D2, otherwise known as PGD2, is an eicosanoid responsible for many ill effects on the body. PGD2 can cause severe or even deadly reactions for a small percentage of our population; however, if you are a man, the bullet point that made your heart rate pick up the most was probably the last one. 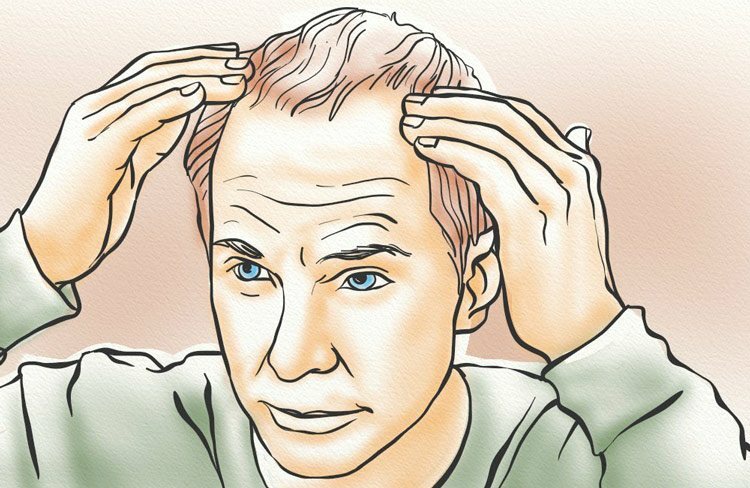 As you are probably well aware, male pattern baldness affects approximately seventy percent of the male Caucasian population before they hit the age of seventy (7). The loss of hair leads men to feel less confident about themselves and their bodies. To make matters worse, there are only a few medically approved treatments for the condition, and even those courses of action can be dangerous or unhelpful. Even worse than just triggering hair fall, PGD2 has also been shown to induce calcification (8). For years, dihydrotestosterone (DHT) was believed to be the sole cause of pattern balding. Over time, though, researchers learned that sensitivity to DHT is just one component of its progression. Another component? Calcification (9). The follicle is an organ that’s connected to the circulatory system via blood vessels found at its base. These vessels deliver oxygen and nutrients to the follicle, as well as enable the removal of waste buildup. Calcification occurs when an excess of calcium is deposited into the arteries and surrounding tissues which causes a narrowing of the arteries and, eventually, complete blockage. This is most often seen in coronary arteries, though blood pathways throughout the body are susceptible to the condition (11). Interestingly, studies suggest a correlation between AGA and heart disease which further supports the theory that calcification may contribute to pattern balding (12, 13). But what causes this increased susceptibility to calcification and, therefore, pattern balding? According to recent research, DHT and PGD2 may be to blame (14, 15). By reducing PGD2 levels, scientists may be able to slow down (or stop) further calcification. Thankfully, a recent scientific breakthrough was published concerning the effects of Prostaglandin D2 on hair follicles. This means that a more reliable cure for slowed hair growth could soon be on the way. A 2012 study conducted primarily by Dr. Garza of Johns Hopkins University and Dr. Cotsarelis of the University of Pennsylvania revealed that the presence of PGD2 is indicative of androgenic alopecia (AGA), the scientific term for male pattern baldness (16). The correlation was first hinted at when scientists found that, just before a laboratory mouse naturally went through its period of hair regression, a rise in the levels of PGD2 occurred. From this finding, Dr. Garza and Dr. Cotsarelis hypothesized that large quantities of PGD2 in the skin inhibited hair growth, likely through the Gpr44 receptor. To test this hypothesis, laboratory mice were implanted with human hair follicles. Then, Prostaglandin D2 was applied topically to some of the mice while other mice had a control vehicle treatment applied. This led to the mice treated with PGD2 having less luscious and long hair than their control peers, as you can see in the charts to the right. In the same scientific article, Dr. Garza and Dr. Cotsarelis mention another segment of this groundbreaking scientific inquiry in which a large, unbiased screening was conducted with the scalps of men with either hair or AGA related baldness. In this genetic analysis, the scalps with male pattern baldness had levels of the molecule responsible for synthesizing PGD2 three times higher than those not suffering from androgenic alopecia. These initial results were checked using mRNA, proteins, and mass spectrometry. 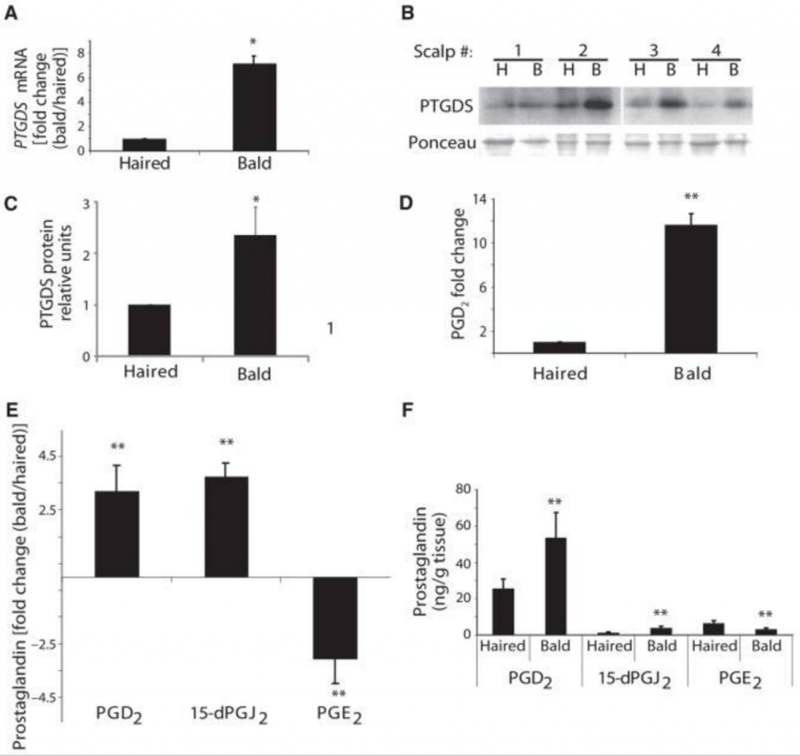 The graphic to the left illustrates the extent to which PGD2 is present in bald scalps as compared to haired scalps. In a related study, Dr. Garza teamed up with another group of Johns Hopkins scientists to determine if Prostaglandin D2 had any effect on the regrowth of wounded follicles, particularly through the receptor Gpr44 (17). They first used mass spectrometry to measure the amount of prostaglandins in full-thickness wounds inflicted on the lab mice. Then, they analyzed the prostaglandins present in the wound at regular intervals to determine the stages of the healing process at which each variety of prostaglandin was most prevalent. Their results showed that PGE2 and PGF2a were predominant during the beginning of the wound healing process, when the bulk of the repair work was being done. During later stages of the wound healing, PGD2 levels increased. A secondary part of the experiment inflicted wounds on 3 species of lab mice and monitored the prostaglandin levels throughout the healing process. When the wound fully closed, the scientists examined the scars on the mice and recorded the number of regrown hair follicles on each one. The scientists found that the mice species with the most PGD2 present in the closed wound also had the lowest average number of regenerated hair follicles. Mice with higher levels of PGE2 and PGF2a had higher levels of follicle regeneration. After that, a direct correlation between PGD2, Gpr44, and hair follicle regeneration was sought. First, the scientists topically applied PGD2 to the healing wounds of some Wild Type mice while treating others with a control vehicle. In the top chart of the graphic to the right, the results are obvious. The mice treated whose wounds were treated with PGD2 has significantly fewer regenerated follicles than the control mice. Still, the scientists desired more conclusive results pertaining to the inhibitive qualities PGD2 presents for hair follicle regeneration. Thus, they obtained knockout mice, which were genetically modified to be missing either Ptgdr or Gpr44, the two receptors that mediate PGD2 activity. 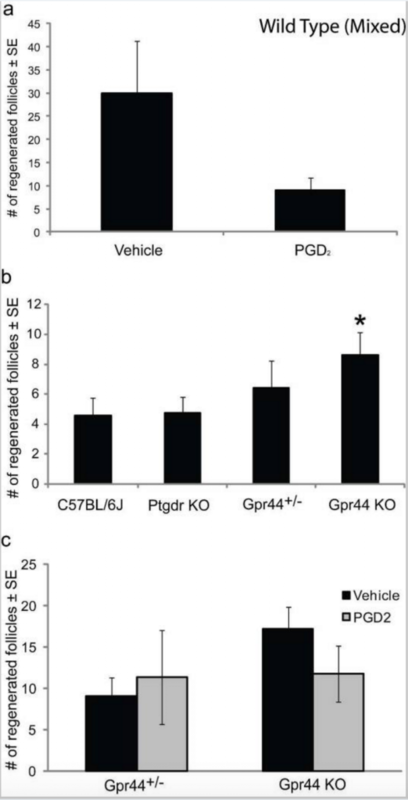 The knockout (KO) mice were joined by mice heterozygous (having two different alleles of a particular gene) for the Gpr44 receptor as well as some C57Bl/6J control mice. Each variety was wounded and allowed to heal. It turns out, as observed in the middle chart, the Ptgdr KO mice had about as many regenerated follicles as the control, but the Gpr44 KO mice had many more regenerated follicles than the control. 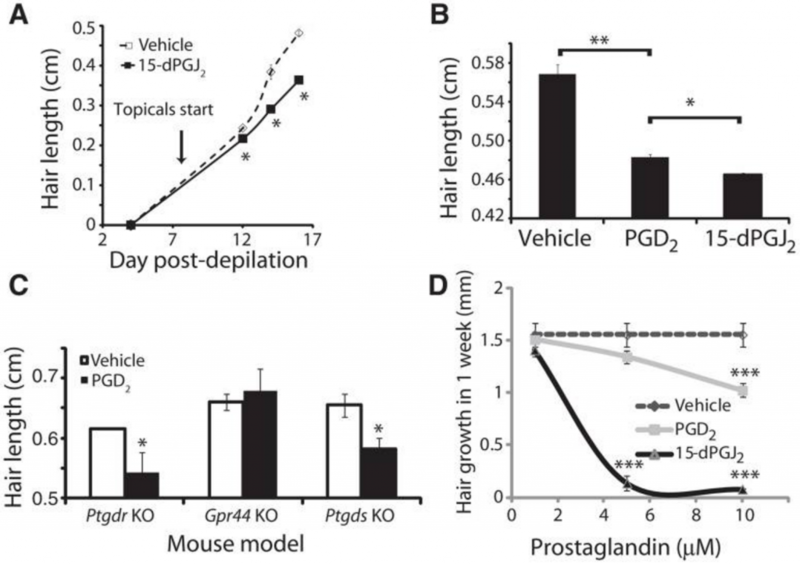 This shows that the presence of Gpr44 inhibits follicle regeneration. Through large quantities of research such as the studies mentioned above, Dr. Garza and his team support the claim that Prostaglandin D2 is a major contributor to androgenic alopecia (18). This leaves the question of how, exactly, PGD2 contributes to the decrease in hair growth attributed to male pattern baldness. There is an informative illustration provided to the right for you to follow along as I explain. It all starts with androgens, hormones that develop and regulate the male reproductive system. These androgens, such as testosterone, fuel the production of lipocalin-type prostaglandin D synthase (L-PGDS) since PGD2 is vital in preparing male reproductive systems (19, 20). Though these hormones, particularly testosterone, are vital in shaping mere boys into vigorous men, they are also proven to cause AGA over the long term in men who are genetically predisposed to the condition (21). Since women only produce about one twelfth of the androgen men create, this explains why women don’t ordinarily go bald while their husbands do. PGD2 is created through a long and complicated process known as the arachidonic acid cascade, which is shown in the oval diagram within the illustration above (22). Once a stimulus activates a cell’s phospholipid membrane, phospholipase releases arachidonic acid from the membrane. The arachidonic acid is metabolized by the COX enzyme to become PGH2. Prostaglandin H2 is a sort of origin prostaglandin, as its molecular structure can be modified through various synthase reactions to become a prostaglandin such as PGE2, PGF2a, or PGD2. If circumstances are right, the arachidonic acid cascade can create a high level of PGD2 while lowering the amount of PGE2 in the region. As you know from earlier, Prostaglandin D2 inevitably results in the slowing of hair growth. 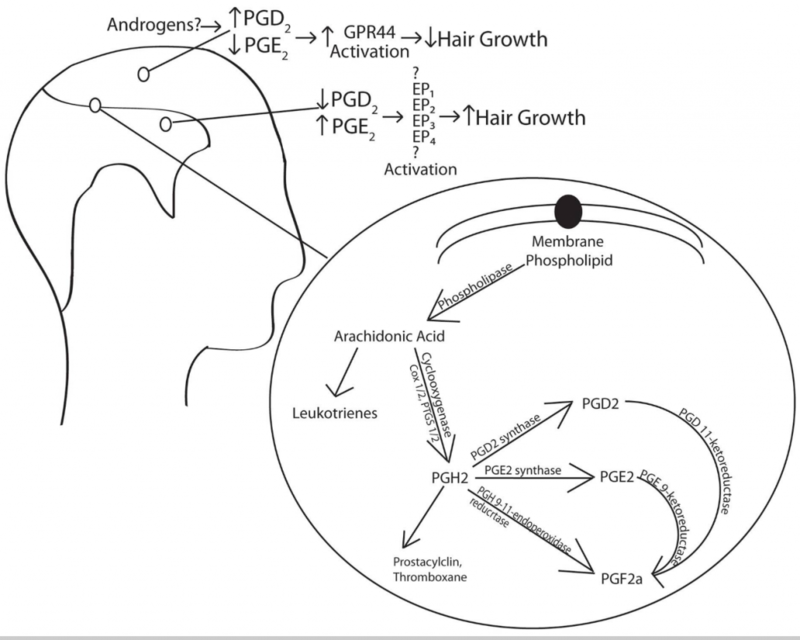 However, it might come as a surprise that other forms of Prostaglandin such as PGE2 and PGF2a are actually linked to an increase in hair growth speed (23, 24, 25). There is a sort of “Yin-Yang” balance when it comes to Prostaglandin: some forms are good for you, others not so much (26). 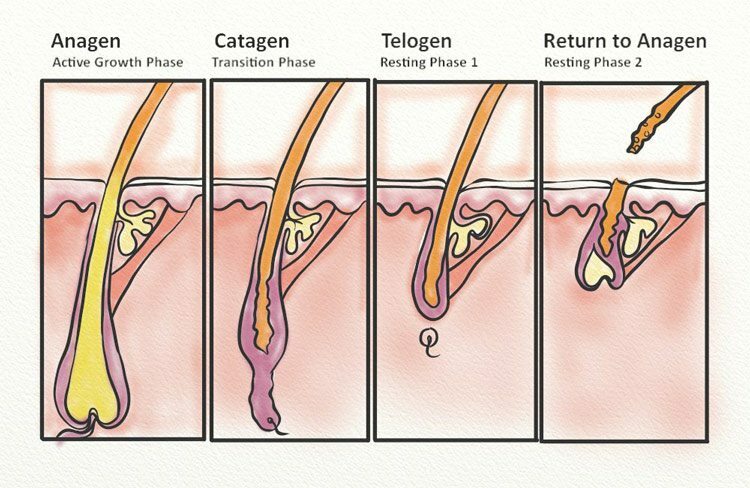 Both PGE2 and PGD2 are located within compartments in the hair follicle, so they have direct impact on the development of the hair (27). Female scalps seem to contain hair follicles that produce more prostaglandin than men, especially the good PGES and PGFS (28). This could be another reason why a majority of women don’t experience massive hair loss as they age. The rise in PGD2 levels leads to the activation of Gpr44 protein, also known as the prostaglandin D2 receptor (29). Gpr44 has been shown to statistically be nominally significant in association to AGA (30). When this protein is activated, it spurs the activation of effector proteins that in turn shrink hair follicles and create a physiological response: the slowing of hair growth (31). Increasing PGE2: A Possible Treatment Pathway? If PGE2 is shown to induce hair growth, then would increasing its levels in the scalp be a possible treatment for PGD2-induced hair loss? According to recent research, it’s certainly a possibility. Bimatoprost is a drug that was originally developed (and still used today) to reduce intraocular pressure and treat glaucoma in adults (32, 33). However, clinical studies showed there to be one unintended side effect: eyelash growth (34). So, what does this have to do with PGE2? Bimatoprost and similar prostaglandin analogs have been proven to work by regulating the outflow of fluid in surrounding tissues and, as a result, reducing pressure. It has been postulated that this may prolong the eyelash anagen phase which is the phase of active growth. That’s not to say that bimatoprost and similar drugs would be effective on the scalp. However, it is a possibility and one that requires further research. Let’s look at the latest research in regards to treatment. Scientifically, a cure could in fact be very close. Since Prostaglandin D2 is a known cause of slowed hair growth, dermatologists are looking into ways to limit the production of this dangerous eicosanoid. This could involve impeding a step in this prostaglandin’s pathway such as inhibiting the capability of Prostaglandin D Synthase to produce PGD2 (35). Another solution would be hindering the ability of PGD2 to attach to Gpr44 or CRTH2 receptors, therefore increasing the anagen, or growth, phase of hair (36). Since Prostaglandin D2 plays such a large role in allergic reactions, inflammation, and asthma, many companies are doing research into halting its effects. Some of these drugs have made it quite a ways in the research pipeline, according to an interview with Dr. Garza. Though these drugs would most likely take the form of tablets, they could easily be modified into topical applications, according to Dr. Cotsarelis. Dr. Cosarelis is more optimistic, saying that more research is needed to fully determine whether the effects of Prostoglandin D2 can be reversed. Either way, I have gathered some information on topically applied therapies that can slow down further loss of hair until new PGD2 inhibiting drugs enter the dermatological market. Practiced for centuries, Traditional Chinese Medicine (TCM) is an ancient medicinal system which focuses on balance. As discussed above, for individuals with androgenetic alopecia, PGD2 is overproduced and leads to the imbalance of the various prostaglandins produced by the arachidonic acid cascade. Fortunately, there are a few TCM components that may be utilized to bring these back into balance. 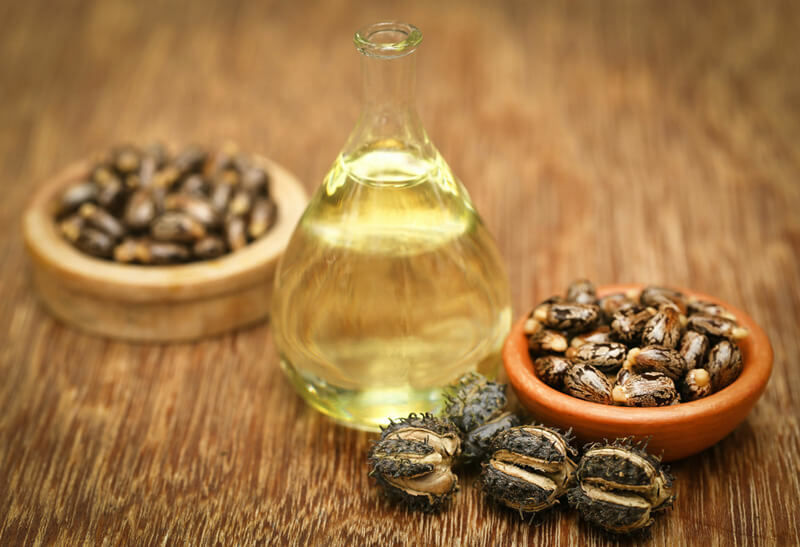 One of the herbs tested in the study was ricinus communis, more commonly referred to as castor. The main component which contributes to PGD2 inhibition? Ricinoleic acid. There’s a few reasons for its powerful inhibitory effects. First and foremost, ricinoleic acid has a strong docking score (45). Essentially, the better a molecule can interact and bind with another, the better the odds of inhibition. 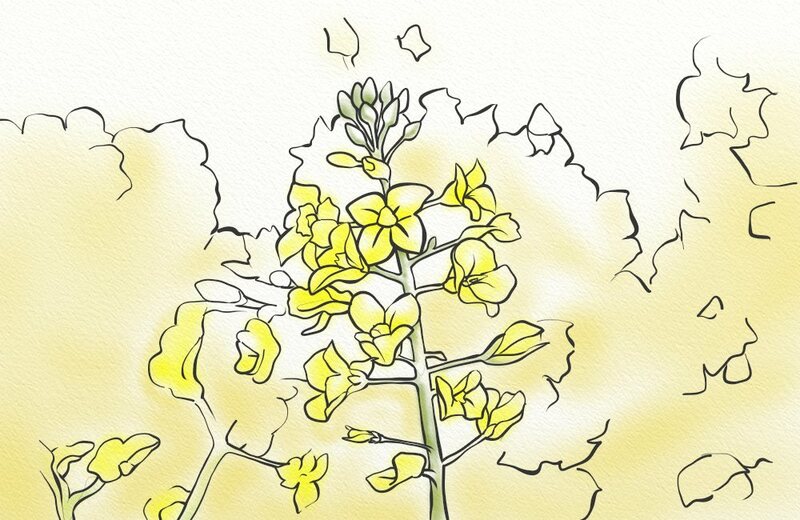 Next, ricinoleic acid has great skin permeability. This is vital for the delivery of the positive effects, including PGD2 inhibition. Chinese foxglove, also known as Rehmannia elata, is an herbaceous plant with hairy leaves and pink, tubular flowers. One of its major components, acteoside, has been indicated as an inhibitor of PGE2 release and production following the ariachidonic acid cascade (46). But since PGE2 has actually been indicated as a hair growth promotor, why inhibit it? PGE2 is produced right alongside PGD2 in the cascade. The inhibition of one (PGE2, in this case) is strongly believed to indicate the inhibition of the other (PGD2). An evergreen coniferous tree, Thuja orientalis is one of TCM’s most used herbs. For the purposes of this post, let’s take a look at the three components within Thuja orientalis that have been shown to inhibit the production of PGD2: quercetin-3-O-rutinoside, amentoflavone, and hinokiflavone (47). Of the three components, quercetin-3-O-rutinoside and hinokiflavone were shown to have high docking scores. This means they interact and bind well with PTGDS, a gene which encourages the production of PGH2 to PGD2. With the inhibition of PTGDS, then, the overproduction of PGD2 can be stopped in its tracks. Onto amentoflavone, this flavonoid inhibits PGE2 biosynthesis. PGE2 is structurally similar to PGD2, so therefore, it’s believed that amentoflavone can similarly inhibit PGD2 (48). A direct application can be the most effective manner of use, increasing the positive benefits you see. Out of the three inhibitors, I recommend castor oil. Not only is it the easiest to apply, but it’s also the TCM herb least likely to cause skin reaction or irritation. All you need to do is start with a palmful of castor oil, working it into your scalp and hair from the roots to the tips. You don’t want to saturate your hair, but you do want to ensure proper distribution. Once applied, leave in for at least 20 minutes, though overnight is best. Rinse thoroughly when done, and shampoo as usual. There is strong evidence that Prostaglandin D2 is at least partially responsible for male pattern baldness and, as such, it’s a good idea to consider it a serious threat when looking to treat your hair loss. However, PGD2 isn’t the only cause of male pattern baldness. The best approach is one that targets multiple factors, and this can be done with the help of scientifically-proven and formulated hair loss treatments. Minoxidil and finasteride are two options, but they aren’t the only ones. Natural options do exist – including the Grogenix line of products – which target the underlying causes of alopecia so as to treat the problem at the source. Do you have questions about PGD2 and its effects on hair loss, or how you can target this molecule? Drop them down below.